On December 20, 2018, the Ministry of Finance of Ukraine (MoF) hosted the final event of the “Train of Trainer” (ToT) project for the MoF – the training “Psychological Aspects of Adult Education”, followed by certification ceremony for the completion of the project. The training was attended by the MoF employees, which were involved during four months of the ToT project implementation. Mrs Bogacheva, acting State Secretary of the MoF, congratulated the participants with the completion of the project and handed the certificates to those who have successfully completed their studies and conducted their own pilot trainings. Participants from the MoF received two certificates: a joint certificate from the MoF and the Deutsche Gesellschaft für Internationale Zusammenarbeit (GIZ) GmbH on participation in the ToT project for the MoF, as well as a certificate from the Consortium for the Enhancement of Ukrainian Management Education in Ukraine (CEUME). CEUME certificate stated the participation in the trainings on social skills development, consisting of two-day training “Presentation Skills”, “Effective Communication”, “Moderation Skills”, a methodological training “Train of Trainers” and a one-day training “Psychological Aspects of Adult Education”. 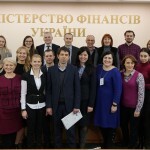 Participants from the State Fiscal Service of Ukraine also received the CEUME certificates, as they have participated in the training course on the development of social skills jointly with the MoF. In general, the final event was conducted productively with a high level of participants involvement in educational activities. Interactive methods were in place during 90% of training time such as: facilitation, group exercises and discussions, case studies etc. that helped participants to consolidate their knowledge and experience, as well as to refill their trainer’s suitcase. The “ToT” project for the MoF is a joint project of the MoF and the Project “Good Financial Governance”, implemented by Deutsche Gesellschaft für Internationale Zusammenarbeit (GIZ) GmbH on behalf of the German Government. By this project it is intended to develop ‘soft skills’ of civil servants in order to apply them for multiplication of their content knowledge – ‘hard skills’, as well as improving cooperation and dialogue within the MoF, between MoF and the Sector Ministries, and other relevant public institutions; ensuring an efficient and effective working processes within public institutions, as well as their service-orientation towards Ukrainian citizens.